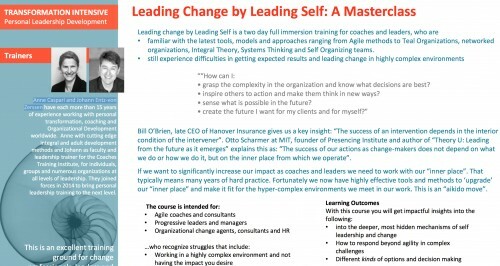 Leading change by Leading Self is a course for those familiar with the latest tools, models and approaches ranging from Agile methods to Holacracy, networked organizations, Integral Theory, Systems Thinking and Self Organizing teams, but still experience difficulties in getting expected results and leading change in highly complex environments. – grasp the complexity in the organization and know what decisions are best? – inspire others to action and make them think in new ways? – sense what is possible in the future? – create the future I want for my clients and for myself? Otto Scharmer, MIT, gives us a key insight: “The success of our actions as change-makers does not depend on what we do or how we do it, but on the inner place from which we operate”. This is like the Master in martial arts who knows that external actions will only be as good as the internal state, and that developing our inner world is just as important as developing our skills and toolbox. The key to increasing our impact and becoming true Masters of our trade is to ‘upgrade’ our inner world to make it fit for the hyper-complex environments we work in. This is the “aikido move” of self leadership. This course will let you explore your inner world and perform some truly spectacular “aikido moves”, which will greatly help you in your job and in other parts of your life. Method: The course speaks to the participants own level of expertise and takes place in a safe and light environment. It uses methods and materials that can be seen through the lenses of Ken Wilber’s Integral Theory, Otto Scharmer’s U-Theory or Robert Kegan’s Immunity to Change work. They can also be cross-referenced with other more intuitive transformative processes, tools and methods. Learning outcomes: insight into the deeper, most hidden mechanisms of self leadership and change; respond with more agility in complex challenges; see more options and take better decisions; strengthen your personal authority and control over what you want to achieve; and go from effectively leading yourself to effectively leading others. The course is lead by Anne Caspari and Johann Entz-von Zerssen and it is hosted by Crisp in Stockholm, Sweden. Read more about the course and register on the Crisp homepage.